The calendar chronicles hundreds of Obama milestones, from his promise to spread Joe the Plumber’s wealth around, to his gift to the Queen of England of an iPod pre-loaded with his own speeches . . . from his signature diplomatic achievement - the Beer Summit - to his dismissal of small-town Americans as bitter gun-toters and religion-clingers. The funniest calendar for Election Year 2012 is available exclusively through Amazon.com through this link: www.TheObamaCalendar.com. There even is a Kindle version available, which is compatible with iPads, iPhones, Android devices, and of course, Kindles themselves. “Obama takes center stage in this calendar, ” said Paranzino, “but it’s far from a one-man show.” Readers will find cameo appearances by First Lady Michelle, who’s finally proud of her country; Bill Clinton (find out what the “first Black President” thinks about the second); Rev. Jeremiah Wright, the Obamas’ pastor for 20 years; and, of course, unrepentant domestic terrorist Bill Ayers, who helped launch Obama’s political career. “This calendar isn’t just about politics,” added Dunnigan. “You’ll get to read about Obama the Jock as well.” Get set to relive the time he bowled a 37, the All-Star Game where he wore “Mom Jeans” to throw out the first pitch, and many other heroic sporting exploits. Paranzino, a former Chief of Staff to a GOP Congressman, had his 15 minutes of fame taking on CBS when it tried to smear Ronald Reagan. Dunnigan is an attorney and canon lawyer, who is still awaiting his 15 minutes. The two formerly practiced law together in Arizona. Paranzino now lives in Maryland, and Dunnigan lives in San Antonio, Texas. They have hundreds of TV, radio and print media interviews between them. 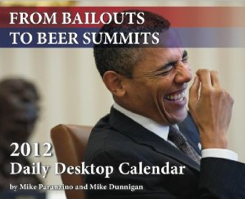 More information is available from www.TheObamaCalendar.com and www.BailoutsToBeerSummits.com .